What do the 131/151 codes mean? The key point to look at here is "O2 sensor low" when analyzing what is happening with the XIED's in place. The O2 sensor produces a 0.0 to 1.0 Volt output. Any voltage lower than a preset threshold in the ECM can trigger the 131/151 errors. 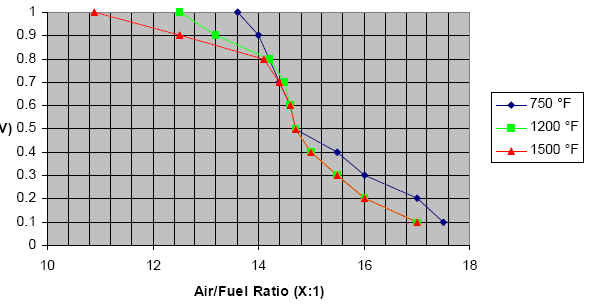 Lower voltage equates to a leaner fuel mixture in the eyes of the ECM. The XIED's take a higher voltage from the O2 sensor and "shift" it to a lower voltage for the ECM to read. In some circumstances, the ECM will see this low voltage as "too low" and trigger the code despite the fact that the engine is running rich enough. The IED's take advantage of this voltage shift to richen the mixture. So the engine can be running rich and the ECM might still trigger the "sensor low" signal. There are also other reasons that the ECM will trigger the codes that we will try to cover below. Will these codes hurt my bike? No. These are historic codes and are not active. As long as these are the only engine codes you have and you do not have an active Check Engine light on, they can be safely ignored. Do all bikes get these codes with IED's installed? No. Many bikes never see these codes. You could also have the codes and never know it. Unless you check the historical codes on your bike, you might never see these. Do completely stock bikes get these errors? Yes. Completely stock bikes get these 131/151 errors on a regular basis as evidence that Harley has included a note to "clear and ignore" these codes in their Service Manual. Don't historical codes mean there is a problem? No. Historical codes only mean the ECM saw something it did not expect. If the code is considered a potential problem or there is a risk of damage to the engine, the ECM will turn on the Check Engine light. No such situation exists with the 131/151 codes. The Harley Service Manual actually notes that these codes should be "cleared and ignored". I have read that these codes cause the ECM to revert back to open loop mode. Is this true? No. The ECM will only revert to open loop operation if there is an active error code. Active error codes will cause the Check Engine light to come on. As long as you have no CE light, your bike will run in closed loop for normal riding situations. When I take the XiED's off my bike, the codes go away. Doesn't this prove the XiED's are creating the problem? No. It can be easy to confuse the installation of the IED's as the cause of the error. This is a normal reaction and quite understandable for the average rider. In engineering circles there is something known as "root cause" analysis. The "trigger" mechanism is not always the cause of a problem. In this case, the "trigger" is the IED's. The IED's do make the ECM more prone to showing these codes, but there are a host of issues that cause the codes. Harley has documented many of these causes in their Service Manuals. A copy of the specific section of the Service Manual is listed below. Are there other things that can cause the error codes? Yes. We have information from an EPA testing laboratory that there are several other issues associated with these codes. These are engineering issues that are deeply embedded into the HD Delphi ECM. Our information also indicates that Harley is aware of these issues, but does not have plans to create any upgrades to eliminate know problems. Can you get rid of the 131/151 codes? Maybe. It is important that a rider ensure that they have eliminated the common reasons for triggering the codes with the IED's installed. The primary triggers are exhaust leaks and loose O2 sensors. Even the smallest exhaust leak can trigger the codes. We have found that many of the bikes that have codes will get rid of them when they carefully check their exhaust system. For those bikes that have double checked their exhaust system and the errors are still present, we have a modified XiED that might reduce the occurrence of the codes. Contact Nightrider.com to see if you are a candidate for this upgrade. Can I just run my bike with the codes and not worry? Yes. As long as you do not get an active check engine light, you can run your bike with the IED's. For any active check engine light, you want to have that checked to find out what is setting off the CE light. Over the past couple of weeks we have seen a number of bikes reporting 131/151 error codes on their bikes. The fact that the majority of bikes installing XiED's never experience any problems is a strong indication that there are no inherent issues with the design and operation of the device. The fact that most of the bikes that experience the 131/151 codes have the codes eliminated after locating and eliminating very small exhaust system leaks should be a further indication that the design is solid and the codes are caused by the exhaust leaks. Some riders insist there are no leaks in the exhaust and declare the IED's defective. I have always been willing to swap out or refund returned IED's for riders that feel there is a problem with them. A few intrepid souls have gone through their exhaust systems multiple times before the codes go away. It is the actions of these riders that have convinced me that there the single cause for the 131/151 codes is fresh air getting into the exhaust system. It is also the only explanation that matches the symptoms seen by riders. Any exhaust leak on a V-twin engine actually allows fresh air back into the exhaust system. It is the interaction of this fresh air on the O2 sensor allows the code to occur. Modern O2 sensors are incredibly accurate, sensing the smallest changes in the amount of oxygen in the air. Even the smallest amount of fresh air into the exhaust system is seen by the O2 sensor and results in a lower voltage being output by the O2 sensor. The 131/151 codes are set if the ECM sees a very low voltage at the O2 sensor line. I believe this voltage is about 250mV. This normally would mean that the 02 sensor is seeing an AFR leaner than 15:0:1. But with the voltage shift of the XiED, it means the O2 sensor is actually producing 450mV (about a 59% voltage shift), but the ECM is reacting to the 250mV it reads as output. A few riders seem to have "caught" the instant the ECM senses the low voltage and noticed an engine stumble as it temporarily shifted back to open loop mode and the leaner fuel mixture it allows. But the riders who noted this indicated the transition from closed loop to open loop and back to closed loop was never longer that 2-3 seconds and was only occurring at idle, generally after a long decel. This observation is consistent with how an exhaust leak or fresh air in the exhaust system and how an ECM should react in closed loop operation. We will continue to expand this article as more information becomes available. 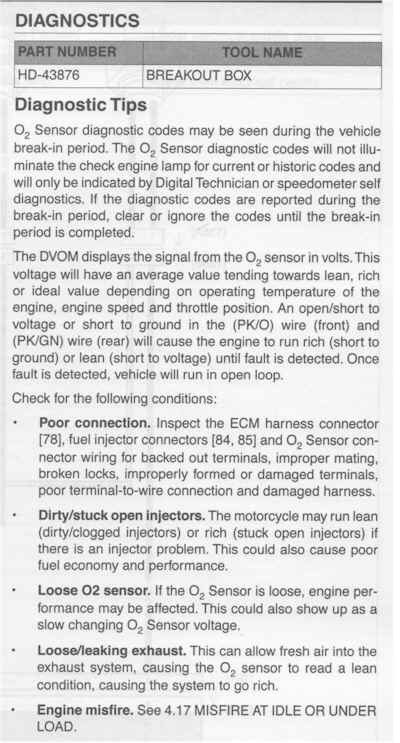 This is the exerp from the 2008 Harley Dyna Service Manual that talks about the 131/151 codes. You will note that they tell you to "clear and ignore" the codes. Their reference is primarily associated with break-in, but it seems strange that something that is acceptable at 999 miles because an issue at 1001 miles. Please notice HD's list of causes for 131/151 codes. We see the last three causes as primary candidates to trigger the codes, especially with the IED's in place. We also have evidence from a state run EPA test laboratory that codes are very likely to be triggered just after initial startup, between the time the engine starts and it revert to normal closed loop operation. We believe the mechanism that triggers the 131/151 codes during startup is associated with how the voltage output of the O2 sensor changes as the sensor warms up. This graph shows how voltage output changes with temperature. The voltage shift of the IED's could be enough to trigger the 131/151 low voltage. There is further evidence from the EPA testing lab that the manner in which Harley and the ECM chooses to read the O2 sensor signals will also cause the error.